Joe Allen has highlighted the threat of Marouane Fellaini and Moussa Dembele when Wales face Belgium in Friday's 2014 World Cup qualifier in Cardiff. The Liverpool midfielder faced Everton's Fellaini and new Tottenham signing Dembele in the Premier League with Swansea last season. 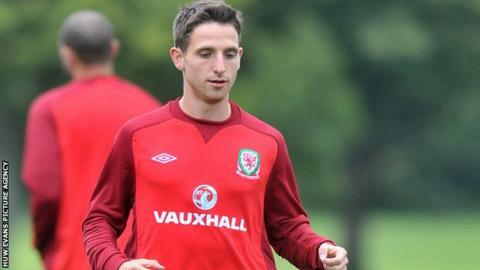 And Allen is under no illusions of the task facing an injury-hit Wales side. "Fellaini and Dembele are the two best midfielders I came up against in the Premier League," said Allen. "If I am playing, I will have my work cut out against the likes of them, but they have strength throughout. "With [Vincent] Kompany and [Thomas] Vermaelen at the back, they have a good spine. Fellaini, Dembele, Manchester City's Kompany and Arsenal's Vermaelen are joined by Chelsea's new £32m star Eden Hazard in a star-studded Belgium line-up for the Group A encounter at Cardiff City Stadium. Wales have a glut of injuries for their group opener at the Cardiff City Stadium, with Neil Taylor (ankle), Craig Bellamy (calf), Joe Ledley (groin) and Andrew Crofts (ankle) all missing. Jack Collison is still sidelined by a knee injury, David Vaughan has an ankle injury and goalkeeper Wayne Hennessey is set to miss Wales' first four qualifiers as he continues to recover from a cruciate knee ligament injury. But Wales will have the 'big three' of Allen, Gareth Bale and skipper Aaron Ramsey fit and available to face a stellar Belgium line-up in the Welsh capital. Belgium can field a side studded with Premier League talent and are being viewed as favourites to qualify from the group. Allen, though, has revealed the desire of manager Chris Coleman's men to end the years of hurt and to see Wales finally qualify for a major tournament. "It's no different from anyone here and we are all massively proud to represent our country. "We will be even more proud if we can get this fantastic nation to a World Cup."